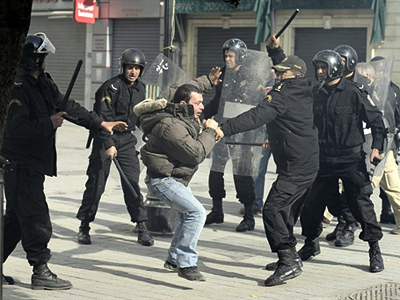 Four people, including a policeman, have been killed in mass protests staged in Egypt. 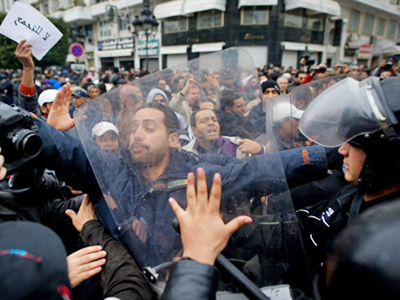 The Egyptians, inspired by the successful uprising in nearby Tunisia, are demanding the resignation of authoritarian president Hosni Mubarak. Thousands of anti-government protesters marched during the “Day of Rage” in Cairo and other Egyptian cities on Tuesday, chanting anti-presidential slogans and calling for an end to poverty and corruption in the country. As later in the day the rally turned violent, riot police used tear gas and rubber bullets on the protesters. As a result, four people have been reported killed, including a Cairo police officer and three protesters in the city of Suez, north of Cairo. Almost 80 people received injuries. Discontent with the authoritarian police regime and President Mubarak, who has been in power for 30 years, has been building up for a long time. 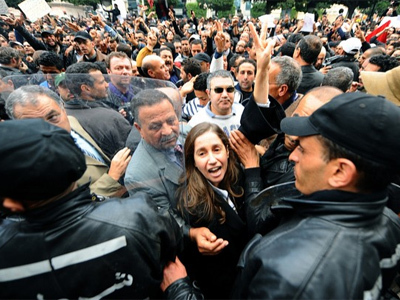 However this week’s protests have been triggered by the recent uprising in Tunisia that forced President Zine El Abidine Ben Ali to flee the country. As the Egyptian protests are believed to have been organized largely through the internet, access to Twitter and Facebook in the country has been blocked. Authorities are urging citizens to refrain from more protests, warning of possible detentions.